For the Home Office, its recently relaunched Prevent strategy was its third attempt at creating an effective counter-extremism strategy. For the Home Office, its recently relaunched ‘Prevent’ strategy (pdf) was its third attempt at creating an effective counter-extremism strategy. Government efforts now have three objectives: challenging extremist ideology, supporting vulnerable people and working with key sectors (including the internet). This should give the strategy the kind of structure it often lacked in the past. Moreover, key areas where radicalisation occurs, particularly online and in universities, are specifically named, helping to ensure they will receive the attention they require. It is one of the government’s less well kept secrets that it had to fight tooth and nail with certain civil servants to get this line inserted into the policy. While Theresa May and David Cameron won the day over working with extremists, they have been forced to make some other obvious concessions. 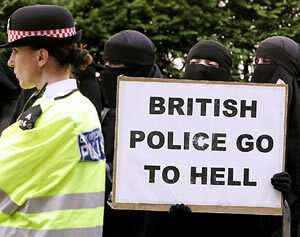 “Under the Terrorism Act 2000, the Home secretary has the power to proscribe groups currently ‘concerned in terrorism’. This power aims, inter alia, to curtail radicalising activity by terrorist organisations. “It should be the role of government to address some of the claims made by terrorist and extremist groups, for example the assertion that the West is at war with Islam and that it is deliberately mistreating muslims around the world. This is a victory for common sense as the manifesto pledge to ban Hizb ut-Tahrir was simply not possible under British law which (rightly) only allows groups involved in terrorism to be banned. Unfortunately, there are also a number of areas in Prevent 3 that are less convincing. In particular, the key fault lines in the battles between Cameron and his opponents can still be traced in a number of areas that lack adequate detail to make the policy effective. Neither side appears to have been willing to concede defeat, leading to a number of ugly compromises which those drafting the policy have tried to disguise with vagueness. The most prominent example of this is as follows. Although Cameron opposed usage of the term ‘Islamist’ back in 2007, by the time he gave his Munich Speech in February 2011, he had become convinced of its value for giving focus to counter-extremism policy. “Islamist extremism is a political ideology supported by a minority. At the furthest end are those who back terrorism to promote their ultimate goal: an entire Islamist realm, governed by an interpretation of Sharia. Move along the spectrum, and you find people who may reject violence, but who accept various parts of the extremist worldview, including real hostility towards Western democracy and liberal values. Earlier guidance from RICU (pdf) was even more strident, advising against using ‘Islamist’ or ‘Islamism’ at all. The result of this clash is that Prevent 3 uses the term ‘Islamism’, but adopts a definition of it which completely undermines its usefulness. “Islamism is a philosophy which, in the broadest sense, promotes the application of Islamic values to modern government. There are no commonly agreed definitions of ‘Islamism’ and ‘Islamist’, and groups or individuals described as Islamist often have very different aims and views about how those aims might be realised. This definition is so broad as to even includes devout Muslims who are inspired by their Islamic values to support secular democracy. Such people are clearly not an appropriate focus for a counter-extremism strategy. This leads to the suspicion that the document’s definition of Islamism is the deeply unsatisfactory result of a compromise between Number 10 and RICU. Whilst Prevent 3 enshrines the goal of opposing Islamist ideology, attempts to do so are holed below the waterline by the document’s list of definitions. It is simply far too broad for effective policy development. Even more dangerously, it will foster suspicions that Prevent is simply aimed at depoliticising Muslims, not opposing a specific political ideology. This risks decreasing public faith in the strategy as a whole. Similarly, the Prevent 3 is focused purely on countering ‘terrorism’, not (as it was before) the broader concept of ‘violent extremism’. At the same time, it advises that extremism will now be countered where it may be a precursor to terrorism. This definition has insufficient detail to serve any practical use. For example, does it include people who support the rule of law and the rights of minorities in the UK, but who advocate the creation of a state overseas in which homosexuals, adulterers and apostates are all killed? Most people would include this in their definition of extremism – and such beliefs have certainly been a precursor to terrorism in many cases – but the failure to state this categorically is a serious mistake. By using definitions of ‘extremism’ and ‘Islamism’ which neither include all the phenomena that should be included nor exclude all those that should not, there is a real risk that civil servants will understand these terms as they please. Who they then choose to empower (or challenge) risks bearing little resemblance to what Cameron and May intended. This raises the suspicion that the definitions listed in Prevent 3 have been left deliberately vague. Whether this was simply because those drafting it didn’t understand these concepts, or whether the vagueness was a sop to those civil servants who opposed their inclusion in Prevent at all, may never be known. What is clear, however, is that Prevent workers reading this document will receive neither clear guidance about what Islamist extremism is nor how they should challenge it. Therefore, while the latest version of Prevent is a welcome evolution of the work Labour did in the past, these woolly definitions may be its Achilles heel. There is little point preparing a lengthy counter-extremism strategy if its careless language means its goals cannot be conveyed to those tasked with achieving them. Some how this has more to do with money and less man power. I don’t see why we can’t get those in the photo and have them shot. We’d have done it 50 years ago.